Happy Hump Day! 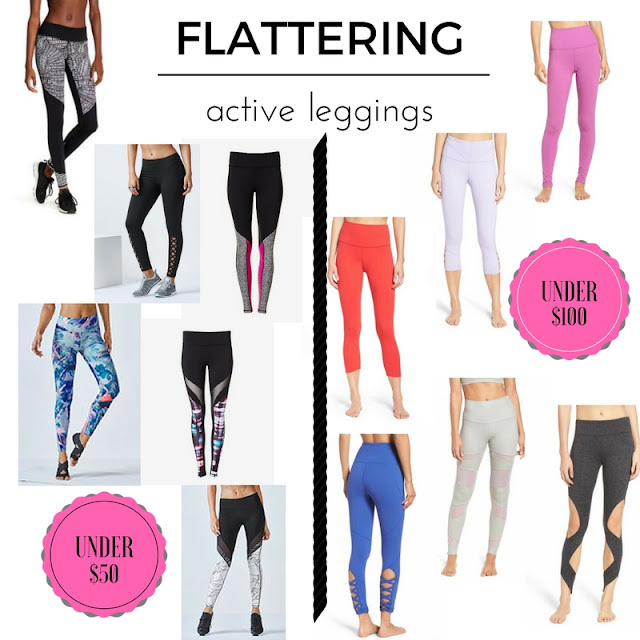 Today we're talking about every woman's favorite piece of clothing - leggings! I don't know about you, but my typical uniform during the week for running errands and working around the house is leggings, nike shoes, and a comfortable tee. Over the years, I've started to get picky about my leggings. I want my leggings to be thick enough that you can't see through them when I'm doing "down dog" in yoga, quality enough that they can be washed 100 times, and I've really grown to love the high waist band. For some reason having a high waist band feels like the equivalent of wearing spanx when you work out - I'll take it! So today I've rounded up my favorite high waist leggings for working out and they are all under $100. Shop them below and let us know if you have a favorite pair that we missed!! Happy President's Day! I hope you all are having a great holiday weekend! We spent the weekend building a swing set for our girls and are relaxing our way through today and enjoying all the fabulous sales taking place! Speaking of sales, today we're celebrating the holiday by giving you all 25% off your purchase, so be sure to check out our store here. 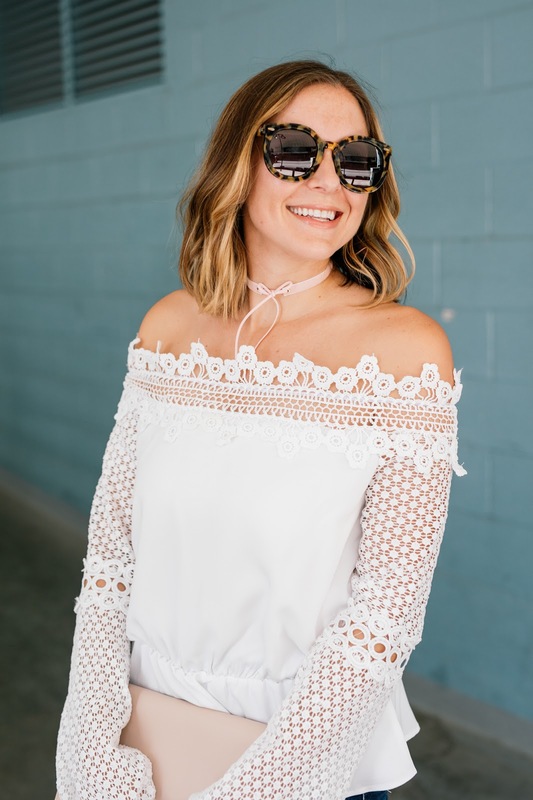 Before we too caught up in all the sales though, let's talk about how fun this top is! 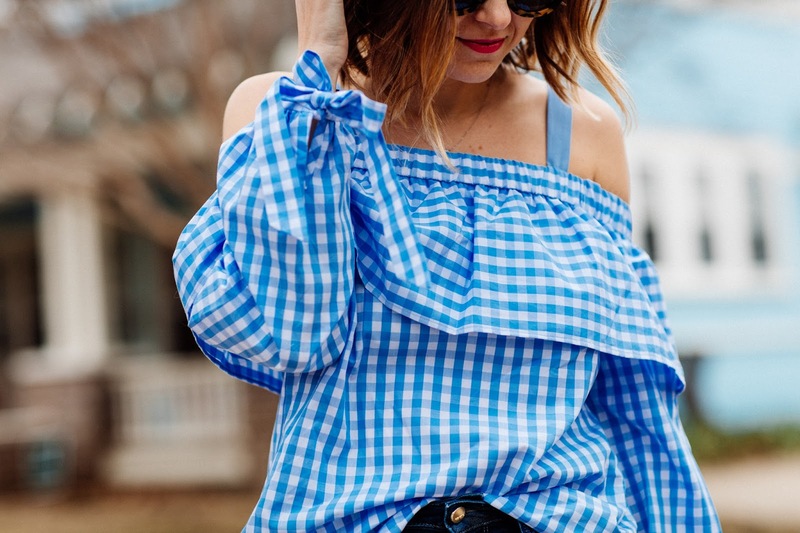 For some reason I feel like gingham just screams Spring! 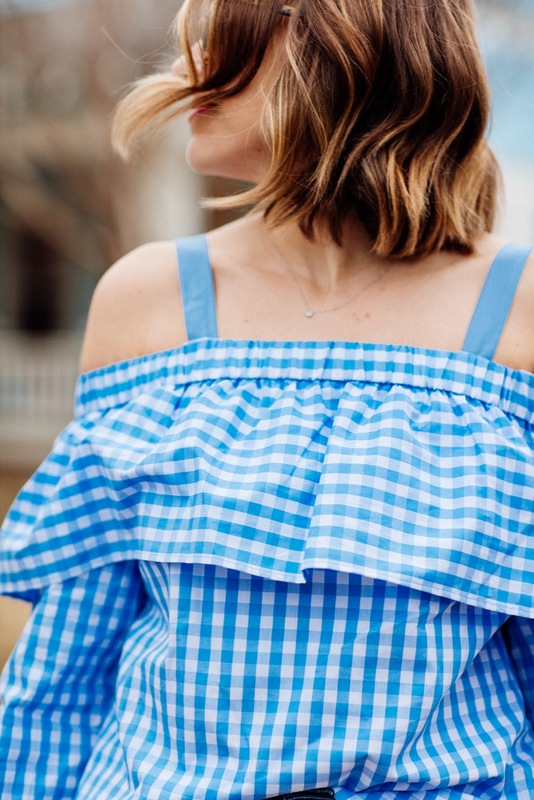 Whether it's a gingham skirt, a gingham dress, or a fun ruffle top with a cold shoulder like the one in today's post, I can just feel the sun's rays shining down on me! Lately it's been quite warm in Dallas, so I can't help but start shopping for warmer weather. 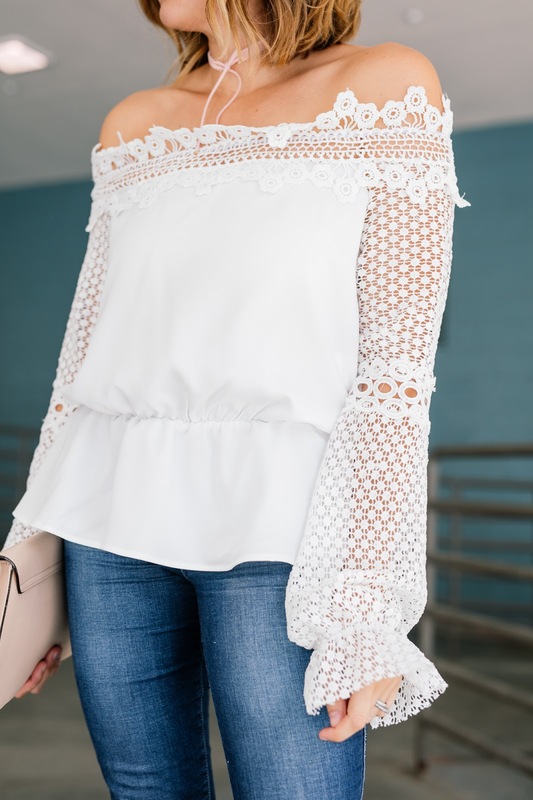 This top is actually a great top to have as you transition from late Winter to early Spring. You can easily style it with jeans and booties and then wear it with denim shorts and slides when the weather warms up. Happy Wednesday!! I hope you all had a fabulous Valentine's day full of relaxation and chasing our kiddos around the house!! With Valentine's Day behind us, I can't help but start feeling like Spring is right around the corner, and to me, this top just screams Spring! I love the delicate, detailed sleeves and the crochet hem give this top such a light, airy feel. 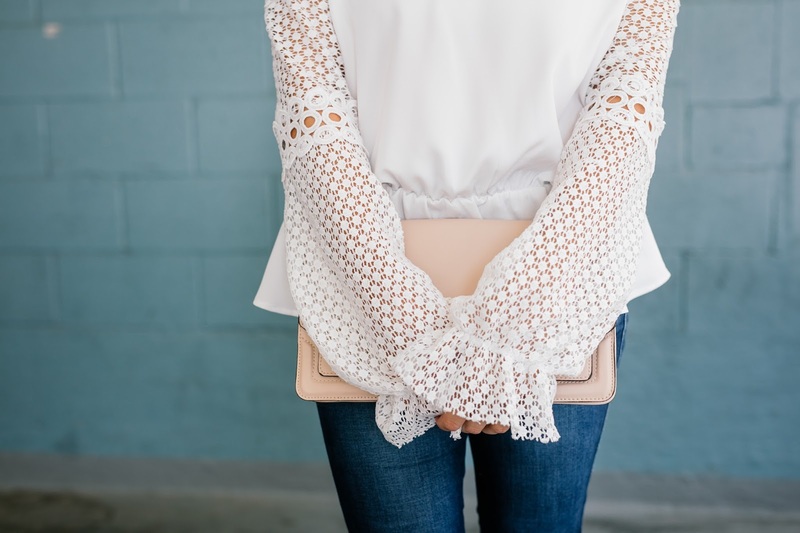 This is one of those tops, too, that you can style so many different ways. 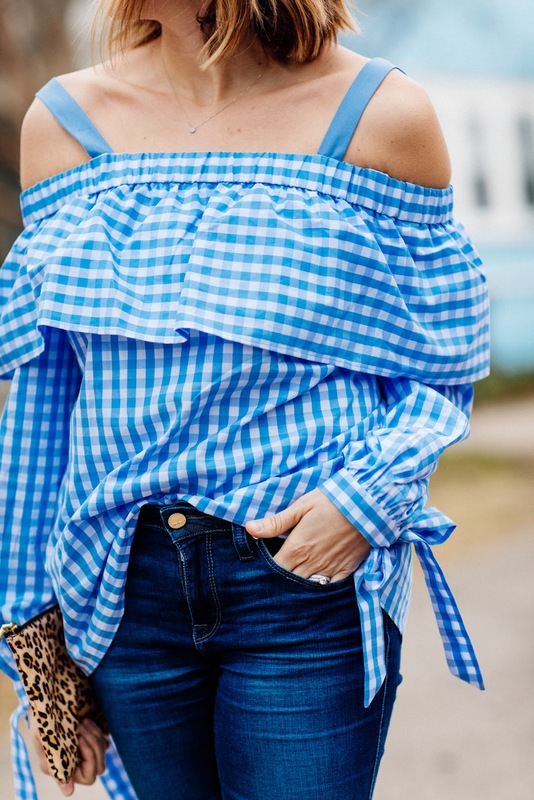 I styled it with jeans and heels since it's still a bit cold outside, but think this would look adorable with a pencil skirt for a more polished look or with cutoff denim shorts for a more relaxed feel! How would you style it? Happy Monday!! I hope you all had a great weekend! Here in Dallas the temperatures have been creeping up into the 80s and it has me thinking about the beach! When I pack for the beach there are two main things that make it to my suitcase - swim suits and breezy sundresses. Lately I've found several quality dresses from Asos and this dress is no exception! I grabbed it to take on an upcoming trip to California because this dress just screams beach. I love the bright colors, the ruffles (right on trend), and the way the fabric moves in the wind. 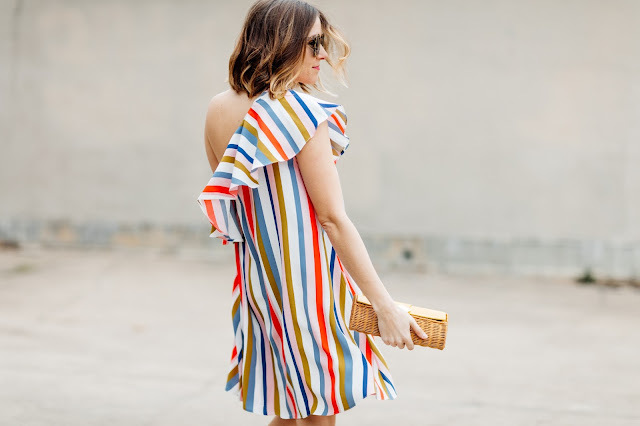 The one shoulder trend is one of my favorites because it looks good on women of all ages! It shows enough skin with the one shoulder cut to flatter your figure, but hides your cleavage. The length on this dress is also appropriate for a woman in her 20s, 30s, 40s, or 50s+. Let's face it, a one shoulder dress should be a beach staple for every gal! 2017's Color of the Year - Greenery! Have you heard? 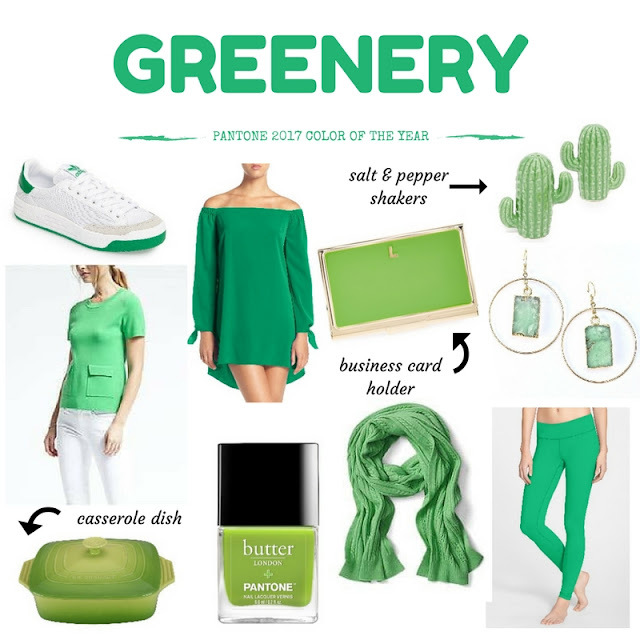 This year's Pantone color of the year is Greenery! I'll be the first to admit that I wasn't so sure about this color at first as I don't actually own a lot of green. However, after reading about it and seeing some of the cute merchandise out there, I'm all about it! Before we go into the actual color, do you all know what the Pantone color of the year is? Each year Pantone picks a color for the year that tells us a little bit about where we (the world) are culturally, and "serves as an expression of a mood an attitude" as Pantone so eloquently puts it. Greenery was picked for this year as a symbol of nature and all of Spring's promises to renew, restore, and refresh. I feel like it's a symbol of that feeling that you get when you escape the city, unplug, and just enjoy the great outdoors whether that be hiking, skiing, or meditating. So to kick off this year's Pantone color of the year, I'm sharing some of our favorite items in this year's color! Also, I'd love to hear what your thoughts are about this year's color. Do you love it? Do you like what it symbolizes? Feel free to let me know in the comments below! Happy Monday! I hope you all had a wonderful Super Sunday - that game was amazing! But today it's back to work and we are talking about going back to the basics. There will always be trends that are fun to try - bold colors, fun patterns and prints, but the basics will always be in style. One of the basics that I believe every woman needs in her closet is a little black dress. And not the LBD that you wear to weddings, but that LBD that you can literally wear anywhere. This black bodycon dress has been in my closet for years, and each season I have fun styling it in a new way. For today's post I styled it with this vegan leather drapey jacket (under $90), some trendy booties, and a little pop of color with my pink fan earrings. This would be a great outfit to wear out with friends to brunch, to dinner, or to grab drinks. I also styled this dress recently for a day full of errands by styling it with Adidas sneakers and a low pony tail. The options are seriously endless! Happy first day of February! Can you believe Valentine's Day is right around the corner? What are some of your biggest traditions? I will be sneaking away for an overnight staycation with my husband this weekend, but our real celebration will happen on Valentine's Day with our girls. Every year on Valentine's Day we continue the tradition that was started with my mom - an all red and pink dinner! Starting from when I was a little girl my mom served us a formal dinner every Valentine's Day and everything we ate was either red or pink. It was super fun and something we always looked forward to, so we decided to carry it on with our girls! Whether you're sneaking away for a staycation, having a date night with your significant other, or just going out with the girls, it's always fun to dress up! 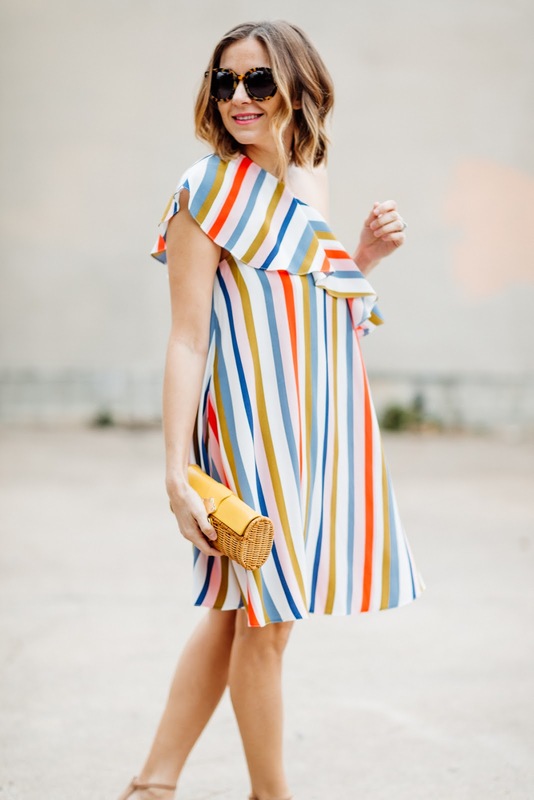 I've rounded up my favorite dresses under $100 below and can't wait to hear how you plan on spending your holiday!